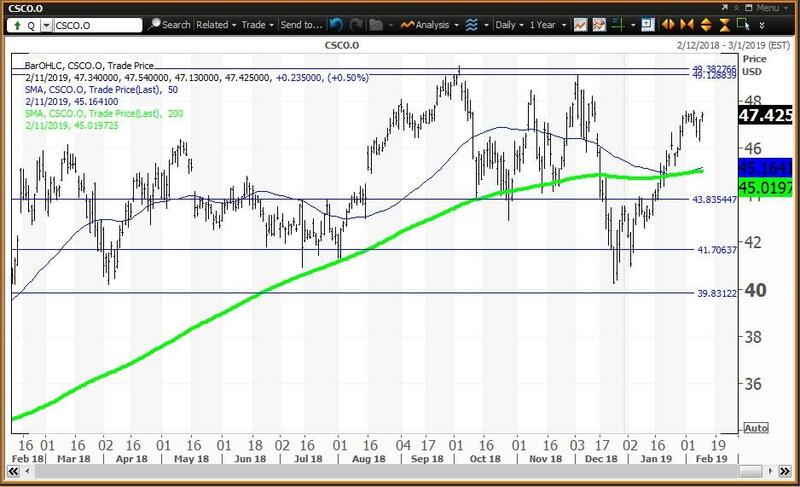 At the end of January, Cisco Systems looked wobbly but it stayed above its 200-day moving average at $44.86, avoiding a 'death cross,' and regained technical momentum. Here is why a starter-position is justified. Cisco Systems Inc. (CSCO - Get Report) is one of the cheapest components of the Dow Jones Industrial Average in terms of paying a dividend. The stock ended 2018 with a dividend yield of 3.32% making it one of the eight "Dogs of the Dow" for 2019. At Friday's close of $47.19, the stock is up 8.9% year to date and up 17.2% from its Dec. 24 low of $40.25. The stock still has a favorable dividend yield of 3.14%. At the end of January, the stock looked wobbly, but when it stayed above its 200-day simple moving average at $44.86 on Jan. 28, it avoided a "death cross" and regained momentum. The weekly chart helped as it was already positive at the end of the week of Jan. 25. Cisco reports earnings after the closing bell on Wed., Feb. 13, and analysts expect earnings-per-share to be between 72 cents and 74 cents. The tech giant makes Internet Protocol networking products for the communications and IT industries. Some indicate that the company's outlook could be clouded by tariffs and weak global economies as uncertainties delay upgrade projects. Cisco's CEO Chuck Robbins appeared on CNBC's "Squawk Box" last week and talked about tariffs, investments in cyber-security and next-generation infrastructure. Cisco is involved in a transformation into software development and subscription offerings and guidance on these services could be the wildcard in this earnings report. Cisco is a holding in Jim Cramer's Action Alerts PLUS member club. Want to be alerted before Jim Cramer buys or sells CSCO? Learn more now. Cisco has been above a "golden cross" since Oct. 16, 2017, when the stock closed at $33.54. A "golden cross" occurs when the 50-day simple moving average rises above the 200-day simple moving average and indicates that higher prices lie ahead. Note that between Jan. 24 and Feb. 5, a "death cross" nearly warned that the stock would be heading lower, but this bearish warning did not occur. The close of $43.33 on Dec. 31 resulted in three of the horizontal lines on the chart. My semiannual and annual value levels are $41.70 and $39.84, respectively, with my quarterly risky level at $49.39. The close of $47.29 on Jan. 31 resulted in my monthly risky level for Feb. at $49.39. This week's value level is $43.84. The 50-day and 200-day are $45.16 and $45.02, respectively. 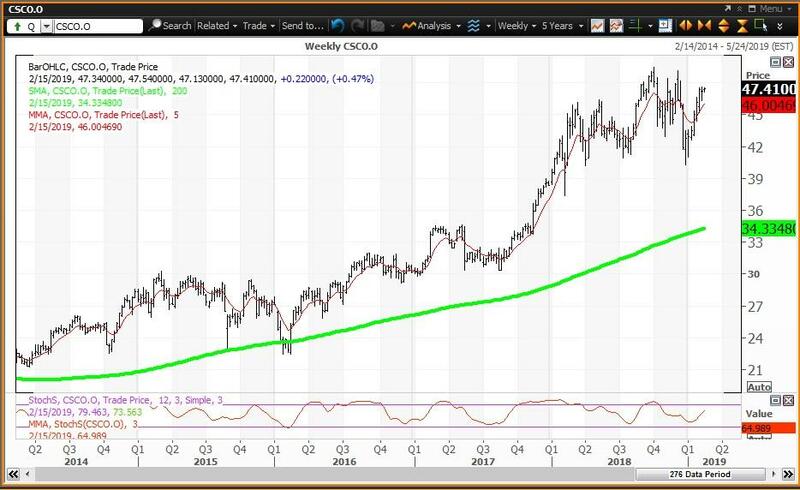 The weekly chart for Cisco is positive with the stock above its five-week modified moving average of $46.00. The stock is well above its 200-week simple moving average or "reversion to the mean" at $34.33. The 12x3x3 weekly slow stochastic reading ended last week at 57.75 up from 49.30 on Feb. 1. Trading Strategy: Buy weakness to my weekly, semiannual and annual value levels at $43.94, $41.70 and $39.83, respectively, and reduce holdings on strength to my monthly and quarterly risky levels at $49.13 and $49.39, respectively. A starter-position is justified, given its favorable dividend yield as one of the eight "Dogs of the Dow" for 2019.